This Is Where Donald Trump Played By The Rules And Learned To Beat The Game "We used to refer to our detention as a 'DT' — a 'Donny Trump' — because he got more of them than most other people in the class," said one of Trump's grade school classmates. 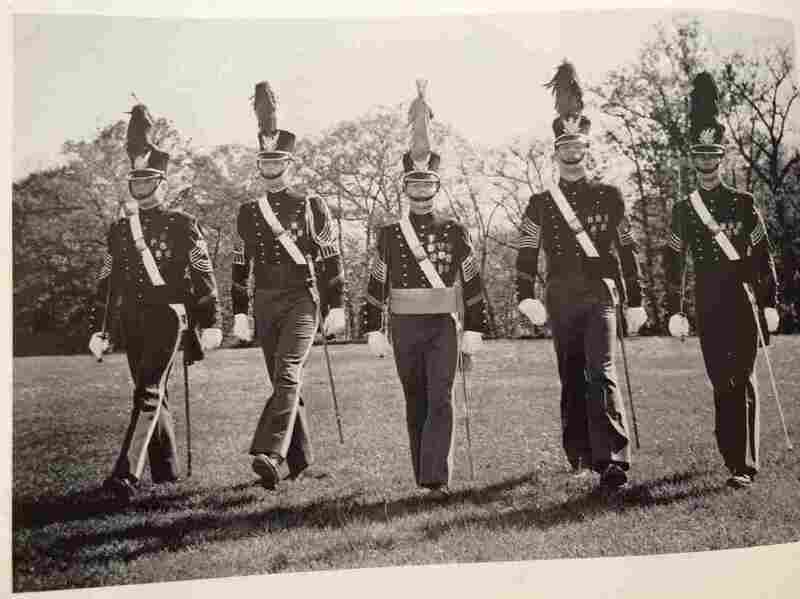 Trump (second from left) and classmates, seen in their 1964 New York Military Academy yearbook. This story is part of NPR's series Journey Home. We're going to the places presidential candidates call home and finding out what those places tell us about how they see the world. Donald Trump's freewheeling, off-the-cuff campaign style can sometimes make him look like he's winging it. Playing by the rules is not what the billionaire presidential candidate is known for. But during a little-known time in his childhood — military school — playing the game meant following the rules. And Trump learned how to win at it. Before military school, Trump was famous for breaking the rules. Long before buildings would be named after him, schoolmates used the Trump name as shorthand for getting into trouble. 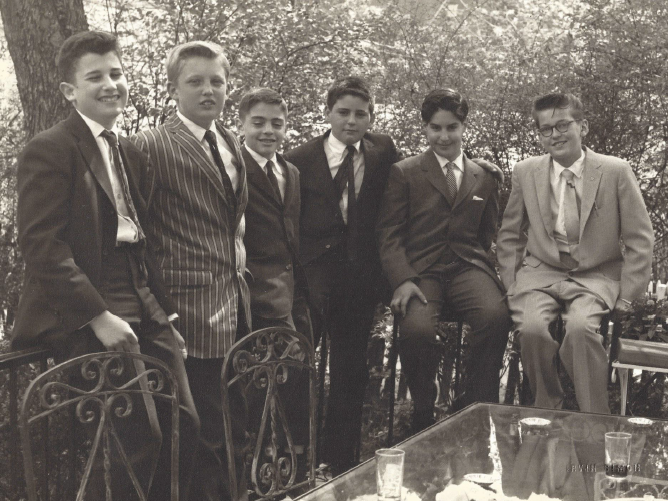 Trump (second from left) and grade school classmate Paul Onish (second from right) got into trouble together constantly — talking out of turn during class, passing notes and throwing spitballs. "We used to refer to our detention as a 'DT' — a 'Donny Trump' — because he got more of them than most other people in the class," said Paul Onish, one of Trump's grade school classmates. Onish calls Trump one of his best friends at the Kew-Forest School in Forest Hills, Queens. Trump attended the school through seventh grade, and the two of them got into trouble together constantly — talking out of turn during class, passing notes and throwing spitballs. Onish remembers a few stunts on the soccer field, too. "There was even a couple of incidences during half-time when we would eat whole oranges without peeling them in front of the competition to show them how tough we really were," Onish said. It was the late 1950s — and in the quiet, well-to-do community of Jamaica Estates, Queens, the nonstop antics became embarrassing for Trump's parents. So right before eighth grade, Trump's father sent him literally up the river to New York Military Academy in the Hudson Valley. Trump would spend the next five years there. Retired Col. Ted Dobias remembers the tall, lanky kid who showed up at his dormitory. "I put [him] down at the end of the hall. He didn't know how to make a bed. He didn't know how to shine his shoes. He had a problem, you know, with being a cadet. You know, being a cadet, you gotta take care of yourself," Dobias said. And Trump the cadet didn't quite know how, at first. Dobias had a reputation for being one of the school's toughest instructors. 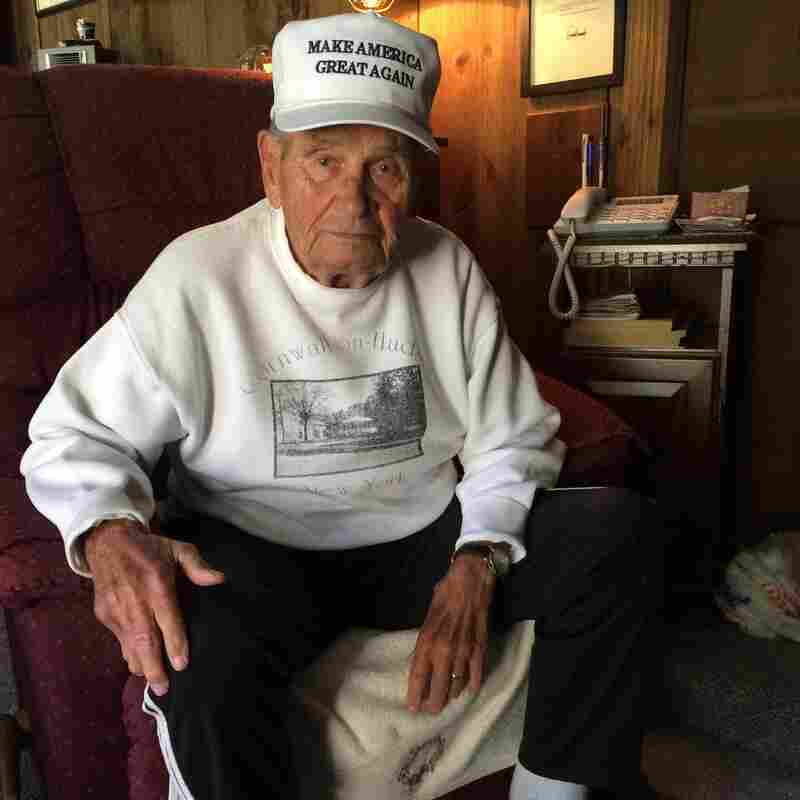 He was a hardened World War II veteran who made it clear to Trump — he didn't care who his daddy was. "When he got out of line, he got the same treatment like everybody else. His name was Donald Trump, like Johnny Jones. It was all the same," Dobias said. "Nobody was different. We treated everyone alike." New York Military Academy, or NYMA, is tucked in a small speck of a town called Cornwall-on-Hudson. It's a short drive from West Point. Arriving here is like stepping back in time. Antique cannons squat on green fields. Buildings date back to the 1800s. Back in Trump's day, cadets would wake up near the crack of dawn, hurry into their uniforms and march in formation to breakfast. First-year cadets had to eat their meals squared-off — lifting their forks in a right angle path into their mouths. And after breakfast, they'd scurry back to clean their rooms for inspection. Dobias said it was a place where kids who didn't like following the rules learned to like it. "It's a hell of a thing for a kid to go to a military school — especially when you have to say, 'Yes sir,' 'No sir,' have to learn how to salute, how to do about-face, how to march, how to carry a gun," said Dobias. But instead of recoiling from the discipline, Trump thrived under it. In her book The Trumps: Three Generations of Builders and a Presidential Candidate, Gwenda Blair notes how "Donald seemed to welcome being in a place with clear-cut parameters, a place where he could focus on figuring out how to come out on top and get what he wanted." Mike Kabealo, one of Trump's roommates at NYMA, said in the confines of the school's rigid rules, Trump wanted to be a standout. "Cocksure, positive and anything-you-can-do-I-can-do-better kind of stuff — you know, he was very competitive," Kabealo said. And friends say Trump channeled that competitiveness into everything at military school. When he was in charge of the rifle rack, he cleaned the rifles obsessively. He was meticulous about his uniform. When it was his turn to do inspections in the barracks, he whipped other cadets into shape. Classmate Ted Levine holds a talking Trump doll, which he sometimes squeezes for advice. It belts out Trumpisms such as "Brand yourself and toot your own horn," and "Have an ego – there's nothing wrong with ego." 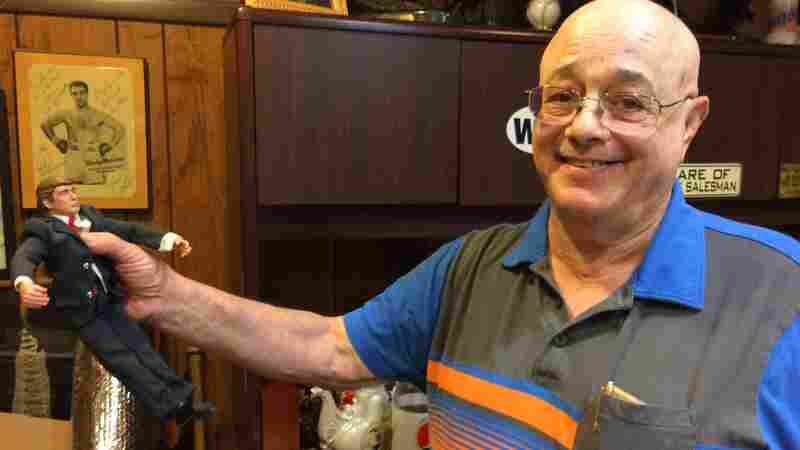 "My bed wasn't really made right, and he ripped it," said Ted Levine, another student who roomed with Trump at NYMA. Trump tore Levine's sheets off during inspections one morning. Levine's bed hadn't passed muster. "Then I lost it. I totally lost it. So I think I hit him with a broomstick," remembered Levine. "And he came back at me — with his hands. He was bigger than me. And it took three people to get him off me." Levine was 4 feet 11 inches tall back then. Trump was 6 feet 2 inches. In the pecking order of young boys, that size gave Trump authority. It also helped him excel in athletics. Trump became captain of the baseball team, and Dobias was his coach. "He was very coachable," Dobias said. "If I told him, 'Do this,' he'll do it. If I told him to do it the other way, he'll do it that way. So that's what made him a good baseball player. He accepted criticism. He wanted to be best. Not better." Trump was made a cadet captain at NYMA — one of the highest honors for graduates. And then there were the girls. Classmates said so many girls visited Trump on Sundays. "The type of women who were coming up to see him or he was bringing were definitely from the upper levels of New York society," said classmate George White. "I mean, I remember there were so many, it was a revolving door." 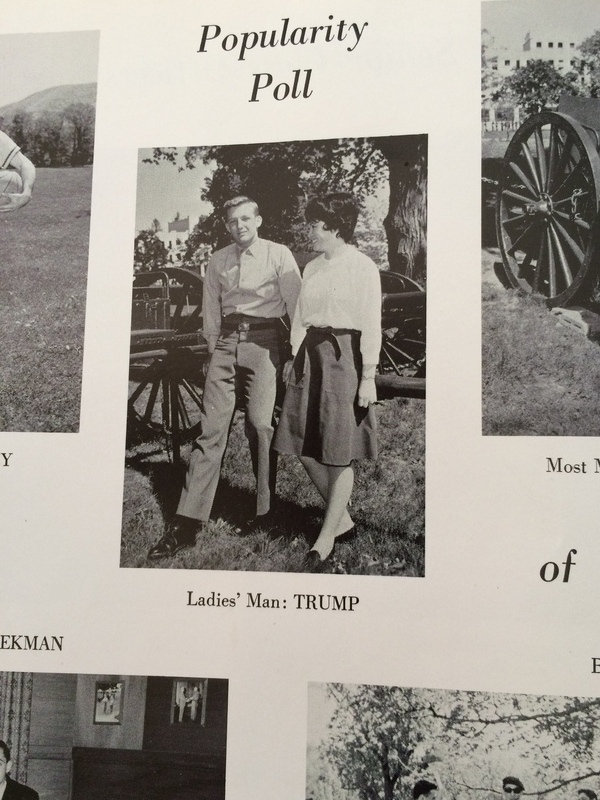 Trump was voted "Ladies' Man" in his high school senior yearbook. His friends say he cared about his hair even then — growing it to the maximum length regulations would allow, so it would look fuller. "The type of women who were coming up to see [Trump] or he was bringing were definitely from the upper levels of New York society," said classmate George White. "I mean, I remember there were so many, it was a revolving door." But as alluring as Trump may have been to the ladies, he had a way of laughing when others spoke that used to get on some of the guys' nerves. "It made you feel like he was separating himself from you. It made you feel like there was an air of superiority. Just enough of a signal that he was laughing at you," White said. And maybe it was that quality that made it difficult to get close to Trump. "I don't think he had a handful of loyalists, you know?" Levine, his former roommate, said. "Because he was so competitive that everybody who could come close to him he had to destroy." But now, more than 50 years later, Levine says he and the other guys still kind of admire Trump. Today Levine's office is littered with Donald Trump knickknacks. Like a talking Trump doll that belts out Trumpisms such as "Brand yourself and toot your own horn," and "Have an ego — there's nothing wrong with ego." Sometimes, Levine said, he squeezes the doll for advice. "It's reinforcement — positive reinforcement of true values that are very important for businessmen," he said. Values like winning — how to fight back and win. Levine gave the doll another squeeze. "Never give up," the doll squawked. "Under any circumstances, never give up." Levine said he didn't learn that one from Trump — they both learned that one in military school.